A swish 1970s-style soiree is the setting for this colourful online slot machine from High 5 Games; it’s called Cocktail Cash and it comes with plenty of sophisticated free spins along with wild multipliers – find out all about it below. 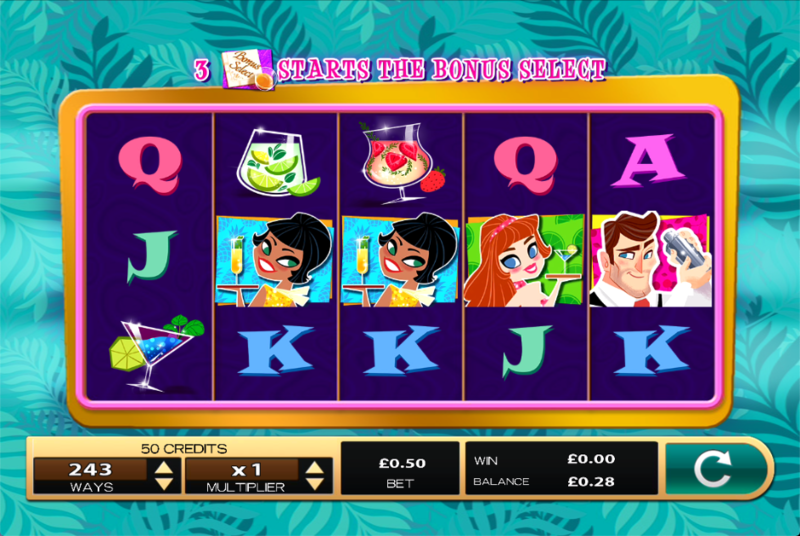 Cocktail Cash is a five reel slot with three rows and two hundred and forty three ways to win which means that there’s no payline structure – wins are formed as long as there are matching symbols in adjacent reels starting from the left hand side. The colours, the design of the reels and the sound effects all add to the retro feel of this game. The high value symbols are all related to the theme and include three guests enjoying the party along with three fruity cocktails which look like they’ll liven up proceedings as the night wears on; J, Q, K and A represent the lower values. The wild symbol is a cocktail shaker which appears only on reels two, three and four but it also comes with a multiplier value of 2x, 3x or 4x which will be applied to any win to which it contributes. The scatter symbol is the party invitation. Three free spins with multipliers of 9x, 15x and 24x. Five free spins with multipliers of 6x, 9x and 15x. Seven free spins with multipliers of 5x, 6x and 9x. Nine free spins with multipliers of 4x, 5x and 6x. Twelve free spins with multipliers of 3x, 4x and 5x. During this round it’s not possible to trigger more spins but if more than one multiplier wild appears in a winning combo then those values are added together and applied. Cocktail Cash is a slot which is rather retro both in style and substance and it’s perhaps a little basic for some players but it’s cartoon graphics are quite cute so give it a spin, but not for too long.